As I’ve started writing about Roman villas on this site, I‘d better say what I think a Roman villa is. I’m going to do this with special reference to Roman Britain, and by looking at various strands of evidence. 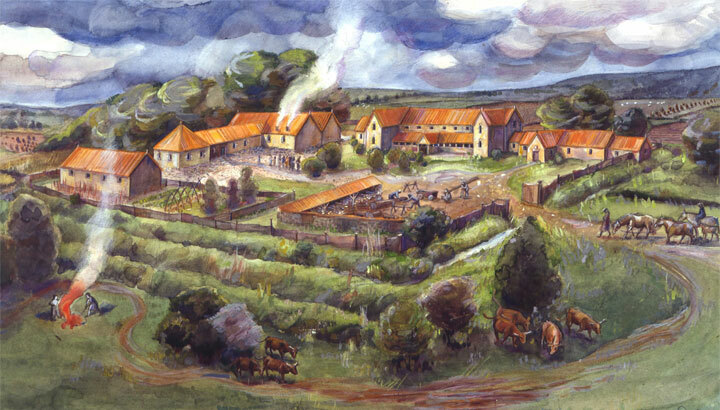 Idyllic Iron Age settlement in Kent (Credit: Canterbury Archaeological Trust, Smith Kriek Productions, drawn by Drew Smith and Mikko Kriek). 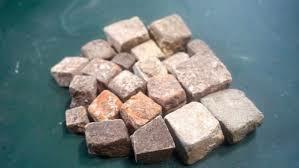 What came after was a different material culture and social experience. In the 21st century academic literature there are plenty of phrases bounced around like 'villa landscape' and 'villa world' and 'villa theory', but for students in particular it's hard to gain even entry-level access to discussions about these fascinating sites because the question, 'Well, what do you mean by "villa"?' is one of those gate-keeping Romanist mini-dramas that are not for the faint-hearted. A few points to bear in mind from the outset of this romp are these. It’s now widely accepted that there are thousands rather than hundreds of them in the Romano-British landscape. And, it’s up to those studying villas (if there’s anyone left ...) whether they see them as a ‘class’ of evidence that is meaningful on its own, or as being on a continuum of ‘romanised’ type rural settlements. Personally I don’t see any reason why they can’t be studied in a multiplicity of ways, as human settlements, through different imagined lenses. There are a lot of perspectives after all involved with the creation, idealisation, uncovering and re-construction of these sites - 'native'; 'Roman'; antiquarian; Victorian; and those of generations of archaeologists, along with all their biases, identity-blindnesses and foibles. Anyway ... can there be a meaningful definition? For what purpose? And, what’s the relevant evidence? Well, that seems pretty straightforward. But yet ... archaeologists don’t talk of finding or excavating a ‘fundus’ – they talk of finding or digging at a villa site. There’s nothing actually there about villa-building. Or fundus-building. This early occupation and associated drive for native investment in the new order was apparently town-focused, which was actually understandable given the proximity to the first towns of the legionary bases and the existing centres of tribal rule, and given the new administrative set-up's powers of taxation and need to monitor and control. In fact only one villa is mentioned in the sources that we know about for Roman Britain – the villa faustini - and may not even have been a villa at all. This ‘villa of Faustinus’ is listed in the Antonine Itinerary but has never been located on the ground. The places listed immediately before and after it in the Itinerary are Colonia and Icinos, identified as Colchester and Caistor, and if the villa faustini lies somewhere halfway between the two then it could be the Roman roadside settlement at Scole in Norfolk or Stoke Ash in Suffolk. A Christian treasure hoard of circa AD 410 found in Hoxne, Suffolk in 1992 contained a silver spoon inscribed ‘Faustinus, may you live’ but it’s impossible to prove any connection. 3 Which is the Best Modern Definition? R G Collingwood kind of nailed it in 1930. This is all good stuff – but what’s the difference between a ‘villa’ and a ‘cottage’ or a ‘native hut’? The thing is, as research from the 1980s onwards in particular started to reveal, lots of ‘cottages’ and ‘hut settlements’ from Roman Britain produce samian pottery and coins, which could be taken as evidence of ‘Romanised manners’ given that the purchase of fine-ware pottery shows conscious involvement in the new money economy of the Roman world. In trying to clearly demarcate the class difference between villa and ‘cottage’, Collingwood didn’t fully take into account and predict the sheer volume of fine-wares and coinage that were used on non-villa sites. The tentacles of the new economy, and the Roman state's imposition of taxation, stretched far into the countryside of Britain; and this complexity makes Collingwood’s definition not quite as definitive as it at first appears. This isn’t just a modern discussion about how grand a building has to be to be considered a villa – the ancient agricultural writer Varro makes one of his literary characters admit ‘villa’ could just as much signify a humble farmhouse as a luxurious country seat (Res Rusticae III, ii, 10). But Romanist angst about ‘villas’ wasn’t practical. And when writing about Roman Britain, it wasn’t sustainable not to have a working definition of sorts. When Martin Millet wrote ‘his’ Roman Britain, in 1990 – and an excellent book it is, too - he came up with a neat trick of distinguishing between ‘villa’ and ‘villa’. ‘The term ‘villa’ in common in archaeological literature ... although it presents difficulties and causes confusion ...buildings, characterized by rectangular plans, the use of stone, solid floors (sometimes with mosaics), hypocausts, and baths, are usually referred to as villas. Provided we distinguish this term from the latin (by using the anglicized form), and recognize that they need not have been known as villae by a ‘Roman’ visiting Britain, the usage is acceptable (The Romanization of Britain 1990, 91-92). Archaeologists make lists. We create catalogues, indexes, records and databases. For this we need to be able to identify things and define them - to recognise and categorise. In England and Wales, when the first comprehensive lists and descriptions of significant sites and monuments were being created, many Roman buildings in the countryside proved problematic. When does a known Roman building have enough Roman amenities to be attributed villa status? Is is really all about the mosaics - a relatively short-lived fashion for covering the floors of some but not all Roman rural buildings in Britain in the fourth century - or are there other levels of Roman material culture we could and should be measuring in some way? 'Most British archaeologists would agree about the definition of perhaps 80 per cent of supposed villa sites in Britain, and will entertain no doubts about those endowed with fine mosaic floors and bath-houses. The problem arises over borderline cases - when does a farm become a villa?' (The Archaeology of the Roman Economy 1986, 89). It's tricky for students and researchers using Historic Environment Records (HERs) to search for villas as a site type when different counties use different criteria and rationales to categorise these sites. When I was putting my Gazetteer together, as a part of my research into basic questions like density of known villa settlement in different regions, it was apparent that what was in one county classified as a 'villa' would in another county be a 'Roman building'; and in another 'Roman occupation' or 'Roman settlement'. It's not too bad when there are at least some excavated or partially-excavated remains to study and make informed decisions about, but there's a whole other category of evidence that is growing year on year - surface scatters in the plough zone. Records will often show that sites have been discovered in rural contexts from chance discoveries or field-walking that could be a villa - or could be another type of Roman site entirely. The kinds of field scatters known - and there are many hundreds of them described in my Gazetteer - which are suggestive of 'villa-ness' include not just stone and tile, but also tesserae (which one presumes were possibly ploughed out from a mosaic or tesselated pavement at some point), and pilae and flue tile fragments (which one presumes originated from within a heated room), and fragments of wall plaster (which one presumes are evidence of plastered and painted walls). Other finds which 'point' to the possible presence of a villa might include fragments of window glass, pieces of marble and good quality building stone, decorative roof tiles, and large numbers of oyster shells (perhaps from bath-houses). Some of these sites might turn out upon investigation to be temples or roadside settlements or small towns; but an awful lot of them have, upon further investigation, looked like villa farm sites of some sort. 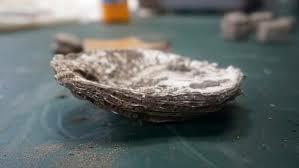 Sometimes the material seems to have originated from a nearby villa farm and found its way out into the fields in Roman times along with manure via farmyard middens. What lies beneath these indicative field scatters is always likely to be significant. 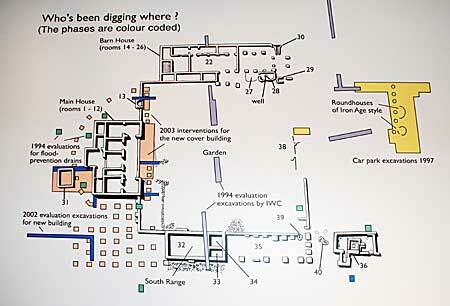 Analytical fieldwalking in the 1980s and 1990s (eg at Maddle Farm, Berkshire) revealed that surface scatters of finds frequently represented just a tiny fraction of the archaeology that remained to be found in the vicinity under the surface - as low as 2%. This was a real eye-opener for archaeologists working in Roman rural landscapes and changed the way that we thought about settlement patterns and distributions. It also meant that perhaps Roman villas in Britain weren't quite so rare as the Ordnance Survey Map of Roman Britain had led us to believe. Perhaps there weren't hundreds of villas in Roman Britain - but thousands. Which leads us on to questions of wealth and investment. 6 Why is a Villa Different from Other Romano-British Farms? This is a key question. I remember talking to Prof Martin Jones when I was just starting my PhD research. He made a really good point to me - why would a farm's actual agricultural output necessarily be any different simply because the owner installed some fancy floors and new windows in the central house? Were the fancy features of villas, such as mosaics, really such a big deal in terms of enonomic outputs? And would we know - and how would we know? - if this investment was at all significant? Well, the answer is that agriculturally, we don't know. But culturally, there was something going on with the material world. That's not to say that there's a clear typology of sites here - there just isn't. If there was prestige value attached to villas this may be why we see such a blurring of the picture, as this sort of building - this idea of a villa - would have been copied at all levels. They'd have been imposing features in the landscape, setting up physical and social barriers. But we are allowed to - we need to - ponder on the symbolism of the material culture that not only forms a back-drop to, but sits centre-stage, at Roman villa sites in Britain. The changing use of social space through time, how people moved, lived and died, the intra-site burials of infants, adults and animals, the religious and ritual spaces, the variety of images in mosaics, the wall paintings and artefacts, the working areas and dwelling rooms, the enclosure earthworks, corridors and walkways, and the imposing high walls and boundaries, the outer yards and paddocks and fields spreading out over many hectares, the uses of water, wood, charcoal and plaster, the smells and the sounds - these all matter as material and sensory culture. And that's what a Roman villa is. A place through time. A setting. And an idea. Acknowledgements and thanks: Portable Antiquities Scheme; English Heritage Photographic Library (Historic England). For assistance with translations, Graham Appleton; for information from her PhD thesis, Karen Griffiths; for other encouragements, Martin Millet, Martin Jones, Ian Hodder, Vince Gaffney and Kevin Greene. Refs: Vince Gaffney and Martin Tingle 1985 'The Maddle Farm Project' in Archaeology and Field Survey in Britain and Beyond; Nico Roymans (ed) 2012 Villa Landscapes in the Roman North; Eleanor Scott 1993 Gazetteer of Roman Villas in Britain.